“Radioactive Man” stands out as a zany, distinctive Simpsons showbiz satire. Within a series that had in-house charlatans like Krusty The Clown and Itchy And Scratchy Studios to reach for whenever it needed to take a chunk out of the entertainment-industrial complex, season seven’s second episode goes outside of Springfield to tweak the wasteful, exploitative practices of major Hollywood studios. And all that requires is bringing Hollywood to Springfield. It makes sense within the reality of the series: The ’burg that harbors the pop-culture grist mills run by Krusty and Roger Meyers Jr. looks at expression and sees only dollar signs. Mayor Quimby’s desire to milk the Radioactive Man production for all its worth is merely the Springfield in him talking. 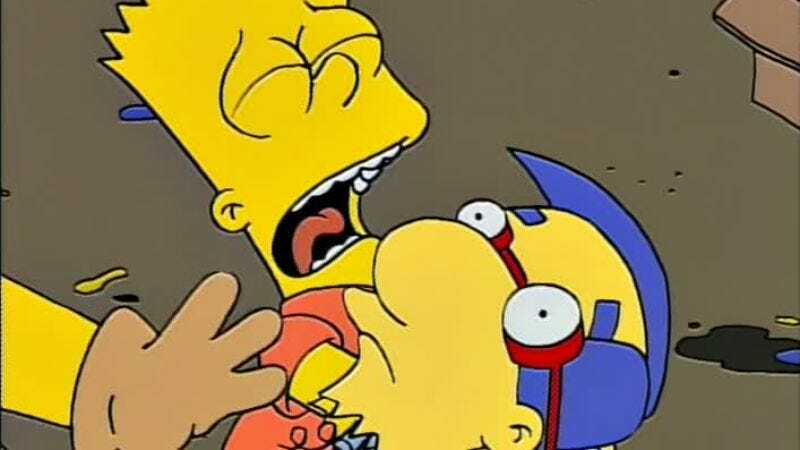 That tendency informs the interpersonal conflicts that arise throughout “Radioactive Man”—most crucially, the one involving Bart and Milhouse. As a send-up of the greed and tedium at the heart of making movies, the Bizarro World Hollywood presented by the episode still scores. But “Radioactive Man” endures because, at its heart, it’s a story about how two best friends couldn’t be more different from one another. There’s no better illustration of those differences than the speech Milhouse gives halfway through the episode, a rant that punches several holes in the glamorous perception of big-budget filmmaking. Bart doesn’t hear it, though—all that registers with him are the fame, fortune, and personal Squishy machine that would be his if he was playing Fallout Boy alongside Rainier Wolfcastle’s Radioactive Man. It’s a potent distinction, one that isn’t undone by Milhouse’s cowardice in the face of adoring fans and giant vats of real sulfuric acid. Meteoric rise to fame are typically portrayed as “Be careful what you wish for” endeavors; a character wants the adoration and bulging bank account, but can’t foresee the downside of either. (Season five’s “Bart Gets Famous” is a particularly strong variation on that theme.) But Milhouse’s side of “Radioactive Man” starts off on the opposite foot: He doesn’t want to audition for the part of Fallout Boy, and he greets every new step of the production process as a back- and spirit-breaking chore. In typical Milhouse fashion, what any other kid in the world might view as a dream come true turns out to be a nightmare of early call times, A Hard Day’s Night-esque throngs of fans, and overspending parents. It’s all heightened for comedic effect, but the truth of Milhouse’s “unfortunate” situation makes it all the funnier. Life has already ground this kid down into a subservient stump; this is one instance that’s served to great effect by Pamela Hayden’s hesitant, nebbish vocal characterization of Milhouse. Here he is, playing a superhero, and yet all of Hayden’s line readings sound like her character has just been asked to take out the garbage. It’s a testament to the Bart-Milhouse bond—and the characters’ devotion to the Radioactive Man franchise—that Milhouse’s casting doesn’t devolve into any sort of emotional or physical confrontation. “Radioactive Man” is more nuanced than that, with Bart mostly mystified at the way his friend shrugs off his golden opportunity. 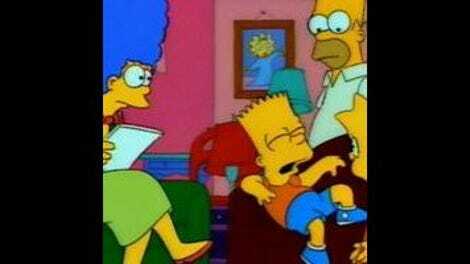 If the roles were reversed, would Bart act the same way? No, because the Simpsons writers have put in so much work up to this point to establish Bart and Milhouse as unique individuals. And because of that friendship, Bart does nothing to sabotage Milhouse’s performance. (Not that Milhouse needs any help in the sabotage department.) “Radioactive Man” recognizes that not everyone yearns for stardom, while acknowledging that not everyone is content to brag about a dad who’s a pretty big wheel down at the cracker factory. The sweetness of Bart racing to find Milhouse in the Simpsons’ physics-defying treehouse is totally earned thanks to that absence of malice—as is Milhouse’s continued use of his stunt double to avoid the everyday details of his life. That’s the strongest illustration of their differences: Bart wants his name in lights; Milhouse wants a 24-hour stand-in. Bart’s repeatedly defeated attempts to circumvent his “inch too short” dilemma feed into the episode’s delectably cynical POV—a view that avoids overripe tropes and easy targets by portraying Hollywood as a paradise of bonhomie, generosity, and rainbows, rainbows, rainbows. The news that Radioactive Man will film in Springfield engages the city’s most exploitative tendencies: As soon as the news breaks, Springfield’s economy pours all of its interests into flattering and fleecing the visiting dignitaries from Tinsel Town. In its fascination with show business—and its revulsion at the business of show—“Radioactive Man”’s script gives itself away as a John Swartzwelder effort. And that’s not counting the fantastically whacked sight gag of characters losing their hats to surprise and air-conditioning intakes (but mostly air-conditioning intakes). “Radioactive Man” balances satire and warmth with panache, portraying an industry with a distressingly blase attitude toward caustic materials (“The goggles do nothing!”) while effectively explaining why anyone would want to join that industry’s workforce in the first place. There is a magical sensation given off during the creative process, provided that you play “keeper away-er” between that process and those who seek to exploit it. That drive to entertain can be a destructive force, but as Bart and Milhouse demonstrate at the end of “Radioactive Man,” it’s powerless in the face of a strong friendship. Speaking of words you’ve said a million times that no longer have any meaning: Nearly a decade after “Sugar We’re Going Down” thrust Fall Out Boy into the mainstream, it’s so, so strange to hear the words “Fallout Boy” not immediately followed by a swipe at Pete Wentz. I threw most of my favorite lines into the main review, but I want to highlight “I’m sorry, I can’t hear you son—I’m in a jacuzzi suit!” because Maggie Roswell’s read on the line just kills me. It’s so like the Van Houtens to dive right into decadence like that.